The whole world is already familiar with the conventional power generating resources like Hydra, thermal and nuclear resources etc. In all the conventional thermal and nuclear resources etc. In all the conventional systems the potential or thermal energy is first converted into mechanical energy and then this mechanical energy is converted into electrical energy. The conversion of potential energy into mechanical energy is significantly. This requires huge capital cost as well as maintenance cost. All across the world researches are trying to convert thermal energy directly into electrical energy by eradicating the mechanical process involved in energy conversions which have significant energy losses. The reason for using new and direct energy conversion methods is to overcome the flaws in the conventional energy generating systems. The possibility of using new sources of energy seems enhanced by the development of new direct energy converters. There are many methods of converting direct thermal energy to electrical energy. In the following section one of the main direct energy converting technology (magneto hydrodynamics) is discussed in detail. The main practical issue with faraday generator is differential voltages and currents in the fluid short through the electrodes on the sides of the tube. (or electric voltage) is induced in the direction at right angles to both flow and field directions. A number of generator configurations have been devised to accommodate the Hall Effect. 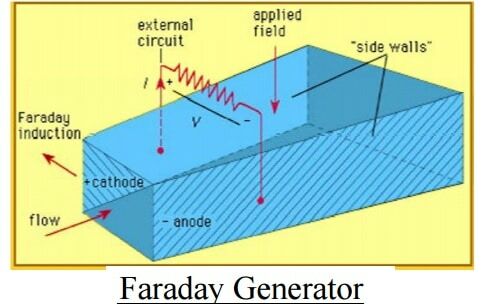 In a Faraday generator, the electrode walls are segmented and insulated from each other to support the axial electric field and the electric power is taken out in a series of loads. In the alternate configuration known as a Hall generator, the Faraday field across each sector of the channel is short-circuited and the sectors are connected in series. This allows the connection of a single electric load between the ends of the channel. Another major benefit of this design is that the magnet is more efficient. Firstly, it has simple parallel field lines. Secondly, the fluid is processed in a disk, the magnet can be closer to the fluid and magnetic field strengths increase as the 7th power of distance. Finally, the generator is compact for its power, so the size of magnet is reduced. As a result magnet uses a much smaller percentage of the generated power. The disc generator is the most efficient design. This design currently grasps the efficiency and energy concentration records for MHD generation. A disc generator has plasma (ionized gas) or fluid flowing between the center of a disc and a duct wrapped around the edge. The magnetic excitation field is made by a pair of circular Helmholtz coils above and under the disk. The Faraday currents flow in a perfect dead short around the edge of the disk. The Hall Effect currents flow between ring electrodes near the center and ring electrodes near the edge.